Bloomberg New Contemporaries annual open submission exhibition returned this year to Peckham’s South London Gallery for the first time in almost two decades. Founded in 1949, New Contemporaries is the UK’s leading organisation for supporting emerging talent from British art schools, helping contemporary visual artists bridge the gap between an arts education and a professional artistic practise. Spread across both the South London Gallery’s main building and newly opened Fire Station galleries, the 2018 edition of Bloomberg New Contemporaries marks the first year artists have been included from non-degree awarding courses. The selection panel, made up of UK artists Benedict Drew, Katy Moran (New Contemporaries alumni 2006) and Keith Piper (New Contemporaries alumni 1986) have chosen 57 artists for this years exhibition, whose work spans the mediums of drawing, painting, sculpture, installation, performance and video. Therefore, if you can’t make it to the exhibition, which runs until February 24th, here is a rundown of my top five Bloomberg New Contemporaries 2018 artists, (in no particular order). 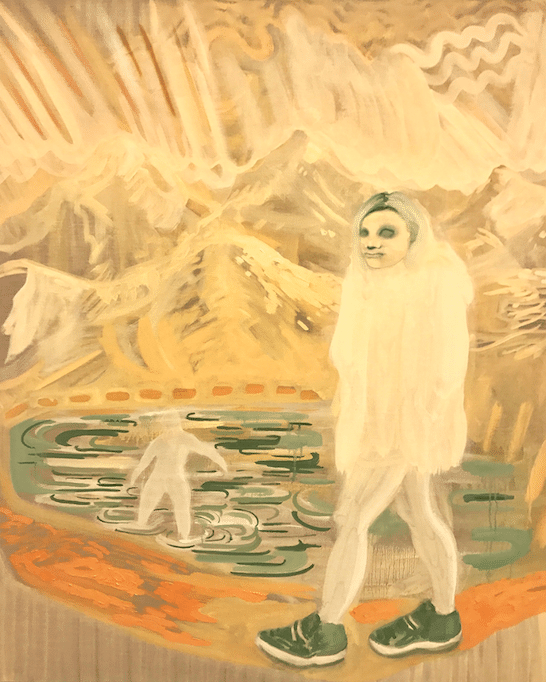 Emma Fineman, ‘My Hometown Was Burning and All I Could Think Of Was That Sun Bleached Wall I Pictured in A Dream About The Dominican Republic’, Oil and charcoal on canvas, 2017. 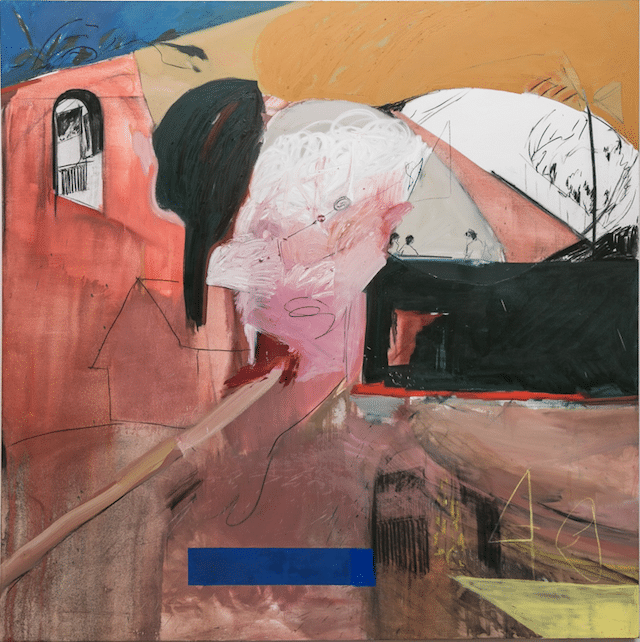 Graduating last year with an MA in Painting from the Royal College of Art, Emma has exhibited widely with solo shows in both San Francisco and London, and group exhibitions showcasing emerging artists such as ‘FBA Futures’, ‘Orbit UK Art Graduates Show’ and ‘RBA Rising Stars’. Describing her work as ‘Personal narrative painting’, Emma explores our means of navigating and understanding contemporary culture. With the age of information overload upon us, Emma pushes painting’s ability to capture a snapshot of time or experience, creating works that transcend traditional narrative timelines and act as a way of journaling for the artist. The introduction of figurative elements within her fragtured painted backgrounds expressing how it feels to navigate the contemporary, increasingly virtual, world. Emma has upcoming solo exhibitions at both BEERS Londonand Public Gallerylater this year. Rebecca Harper, ‘Stouping’, Acrylic and oil bar on canvas, 2017. Winner of the ASC Studio Prize 2018, Rebecca graduated from Turps Art School last year having previously completed post-graduate study at The Royal Drawing School. 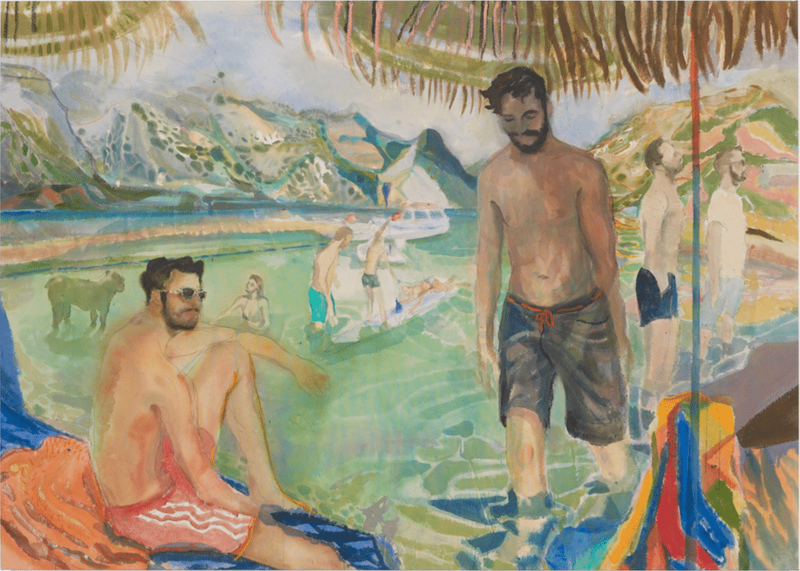 Despite nowadays producing large-scale paintings, her artistic practice is rooted in drawing and sketching the people, places and interactions that Rebecca observes while living in London. These initial drawings are then combined and scaled up to create her paintings, often recontextualising characters and rearranging settings from multiple preliminary sketches to produce an imagined yet cohesive narrative work. The paintings therefore become both fiction and fact, a half-remembered happening or a convincing dream. Rebecca is currently preparing for a solo exhibition, ‘Chameleon’, at Anima Mundi Galleryin St Ives later this year, previewed when the gallery presented a solo booth of her new paintings at the recent London Art Fair. 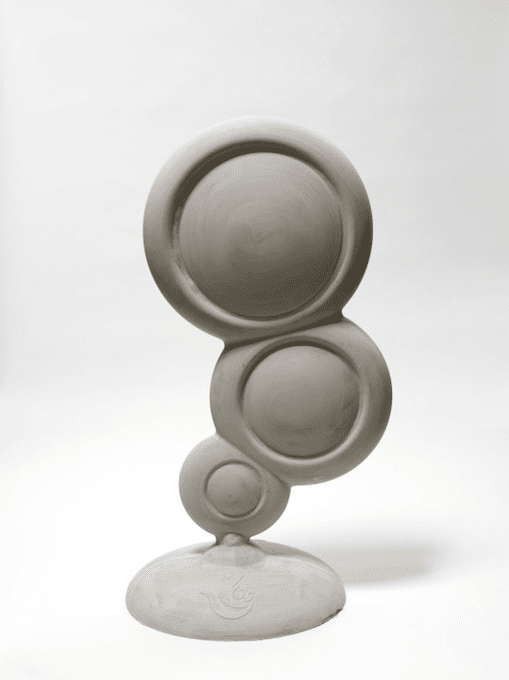 Mimi Hope, ‘Fingers Crossed’, Cast Jesmonite, 2017. Having completed her BA at Chelsea College of Arts, Mimi received studio space from the prestigious Sarabande: The Lee Alexander McQueen Foundation. Taken from a larger body of work exploring ideas of desire and aspirational imagery through the lens of The National Lottery, ‘Fingers Crossed’ sees the recognisable ‘Play Here’ advertising stand replicated in jesmonite. The usually airy blue plastic bubbles become a greyish totemic sculpture, evoking thoughts of permanence and certainty not often associated with The National Lottery. The once playful advertising stand now reappropriated as a tombstone to the dead hopes and dreams of those taken in my it’s former ‘Play Here’, crossed-fingers temptation. Mimi is participating in an upcoming residency programme, Palazzo Monti, in Brescia, Italy later this year. Francisco Rodriguez, ‘Ghosts’, Oil on Canvas, 2017. Francisco completed an MFA in Painting from the Slade School of Fine Year last year, having previously studied both a BA and Post-Graduate Diploma at Universidad de Chile in his hometown of Santiago, Chile. Inspired by graphic novels and anime films/television, much of Francisco’s work retains a certain cinematic quality, recalling the layout of preliminary story-boards or comic strips. Memories of the post-industrial Chilean landscapes of his upbringing act as the backdrop within which the the artist can place his nefarious figures. The artists predominantly male characters, their faces partially obscured by a hats, shadows and masks, loiter through the urban scenes, cigarette in mouth, hiding their intentions as much as their identity. Permeated with feelings of isolation and loneliness easily experienced by those first exploring a large city, Francisco captures emotion through the use of fine line work and a muted colour palette of greens, greys and oranges. 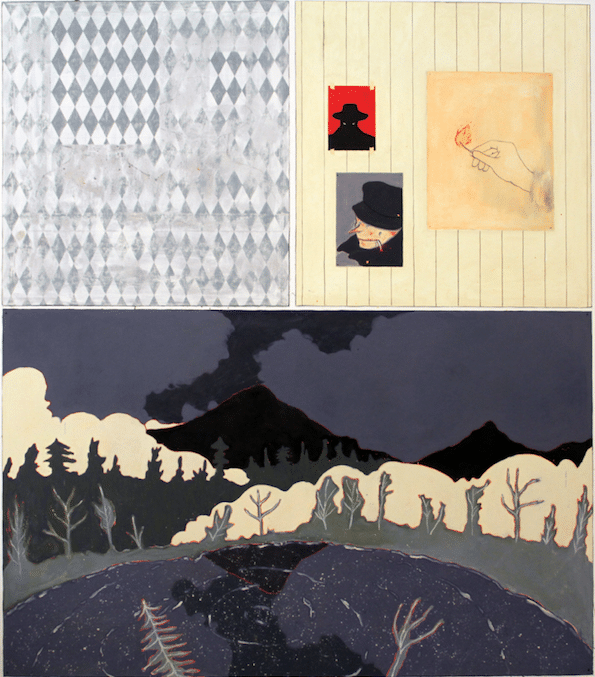 Whether viewed separately or as part of a cohesive series, such as at Francisco’s current solo exhibition ‘The Burning Plain’ at Cooke Latham Gallery(which runs until March 1st), the audience is invited to create their own narrative through the works. Antonia Showering, Introspective Views, Oil on canvas, 2017. Another recently Slade School of Fine Art masters graduate, Antonia also completed her BA and Foundation Diploma at City and Guilds of London Art School and Chelsea College of Arts respectively, her education a triumvirate of prestigious London art schools. Antonia has exhibited widely since graduating, including ‘In The Company Of’ at TJ Boultingin London (curated by The Great Women Artistsfounder Katy Hessel), ‘Kennedy-Doig & Showering’ at Baert Galleryin Los Angeles (curated by Louis Blanc-Francard) and ‘Inhabiting The Dome’ at Whiteley’s Shopping Centre in London (curated by Cara Mills). Antonia’s paintings have the power to evoke a deep nostalgia of events you’ve never experienced, places you’ve never been and people you’ve never met. Combining a palette of golden yellows, rich reds and fertile greens with subdued, delicate brush strokes to capture the very essence of fleeting memories. Landscapes that stretch far beyond the confines of the canvas are populated by vague, often ghost-like figures repeating and reinacting the artist’s recollections. Antonia will feature in ‘Out Of This World’ a group exhibition at Stephen Friedman Galleryin London showcasing female figurative artists, which opens February 7th.